Sarah Ann C., aged 12 years, had for the last two months complained of feeling sick at times, particularly after meals. On the fifth of August last, she vomited up a large garden slug, which was alive and very active. On the 6th, she brought up two, both alive; and on the night of the 7th, she was seized with violent vomiting and relaxation of the bowels, and threw up five more, of various sizes, the smallest two inches long, and all alive. This is, of course, highly implausible. The stomach is a highly acidic environment, maintained at a pH of between 1.5 and 3.5. 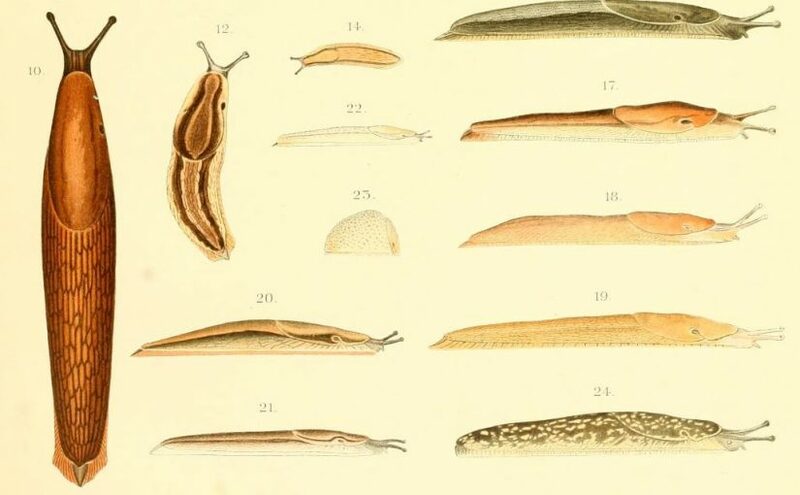 Although some organisms can survive in such extreme conditions, slugs are not among them. On the morning of the 8th, when I first saw her, vomiting and purging had ceased, and she complained of great pain in the left region of the stomach, and headache. I gave her opiate powders, which relieved her in every way until the afternoon of the 9th, when she felt something crawling up her throat. This sensation brought on the most violent efforts of vomiting to expel what she felt at the upper part of her throat, and she frequently introduced her fingers to seize what she felt, but did not succeed. I happened to call, just when all this suffering was beginning to subside, at which time the sensation was felt lower—about half way between the mouth and stomach. A sceptic might remark that this was rather convenient, because it meant that the doctor would not be able to spy the creature by looking down the girl’s throat. As expulsion by vomiting seemed hopeless, it occurred to me that ammonia and camphor might destroy the creature, and that the digestive powers of the stomach would do the rest when the animal was dead. The dose was repeated every four hours for two days, and afterward three times a day for two days more, with entire success. ‘Success’ here is rather loosely defined. The fact that the crawling sensation ceased does not mean that there was ever anything crawling in the first place. After the first dose of the ammonia and camphor, all sensation of movement ceased; and she now seems as well as ever she was. During the summer she had gone frequently into the garden and eaten freely of its produce, especially of lettuce, of which she was very fond. It appears to me that a family of very young slugs had been feeding on lettuce, which the child had swallowed with very little mastication, and the gastric juice not being strong enough to act on them when alive, they fed and grew in their new habitation to their usual dimensions. These hypothetical slugs must have survived in the girl’s stomach acid for days or even weeks! During the time they must have been in the stomach, she was fonder than ever of vegetables and fruits, and would put aside the meat on her plate, and eat the vegetables only. Considerately providing her mollusc parasites with their favoured diet; a theme on which our credulous doctor expands. The three slugs that came up first were not preserved; but, at my request the five others have been kept alive, and fed on vegetables, which they preferred being cooked, having at first refused to eat them raw. What is this, if not proof? They are now fed on raw vegetables. Mr Dickman concludes his article with further evidence of his willingness to believe any old nonsense. Another circumstance connected with my interesting patient is, that she was born without the left hand. During pregnancy the mother was frightened by a porcupine that an organ boy had in the street; and an impression ever after remained on her mind that something would not be right with the child’s hand. To be fair to Mr Dickman, it was generally accepted at this period that the imagination of the mother could exert a powerful influence on the unborn child: the literature is full of tales of pregnant women startled by animals (spiders, snakes, cats etc) who then gave birth to children whose physical characteristics were deemed to be reminiscent of the creature concerned. One extreme example is the American ‘snake man’ whose mother was frightened by a reptile while pregnant. There were also plenty of stories of snakes, insects and other large fauna living inside humans – but by the middle of the nineteenth century most physicians realised that these were invariably the product of an overactive imagination. Sarah Ann may simply have been making a play for attention; if she was suffering from a genuine malady, it was probably a mental rather than a physical illness.